In 2007, Hertfordshire County Council supported the establishment of Hertfordshire Community Meals (HCM) as an independent, not-for-profit, Social Enterprise to provide meals-on-wheels and caring support for people in Hertfordshire. The service with one site in Letchworth, two vehicles, and a team of volunteers delivering meals in the North Hertfordshire district. By 2013, the remaining nine Hertfordshire districts had transferred their clients to HCM and four sites were established across the county in Hemel Hempstead, Letchworth, St Albans, and Ware. We still operate out of these four sites, delivering approximately 500,000 meals and friendly welfare checks every year (seeing up to 2,000 clients every day), and offering a 365 day service across the County. In April 2015, Hertfordshire Community Meals began operating as Hertfordshire Independent Living Service (HILS). This new name reflects that we do far more than deliver meals. We now provide a wide range of services to help improve the lives and support the independence of thousands of elderly, frail, or disabled people, and we have plans to continue to develop more in the coming years. These new services include: the installation of personal alarms to the elderly and people at risk of domestic violence; dementia fun-clubs; and nutrition screening and support. HILS has recently been awarded Social Enterprise of the Year at both the 2014 National Business Awards and the 2014 Hertfordshire Business Awards. We are a charitable Social Enterprise. This means that we trade to do good and support people and we reinvest any surplus into helping our clients. We believe in paying people a fair wage and all of our staff are paid at least the Living Wage Foundation’s Living Wage. We only use paid staff to deliver our meals by vehicle, and volunteers provide vital support to deliver our other services. We also believe in helping people back into work. A number of our staff have found it difficult to work for a wide range of reasons and we have helped them to thrive in the workplace with training and support. Our vehicle fleet consists of 68 cars, which are unmodified and are generally bought on a 3 year hire-purchase basis. We carry our customers’ meals in a pre-heated state in purpose made containers that are secured in the vehicle boot rather than the rear seats, this not only secures the products in the event of a collision but prevents a driver having to unload through a side door onto the road side. As part of the employment process, staff are mandated to agree to a Disclosure and Barring Service check, which includes a DVLA check so that we are aware of any previous traffic offences, allowing us to make informed decisions regarding employment. Never break speed limits or other rules of the road. Always report any damage or incidents to their Team Leader immediately. Employee handbook which also contains sections covering work related driving, for example safe driving techniques. Daily vehicle checks are undertaken by the person who will be driving the vehicle, to ensure that the vehicle is roadworthy, there has been no damage that we are unaware of and that the risk of a breakdown is reduced to as great an extent as possible. Weekly checks are undertaken by nominated members of staff to supplement the daily checks. The weekly checks are more in depth and provide greater detail which allows us to forecast, for example, how much life a tyre has left before it is likely to have to be replaced. Step-by-step guidance to complete these checks is provided along with the documentation used to record the checks. Some of these are attached to the case study as examples. HILS’ driving policies are reviewed annually, taking into consideration any incidents that may have occurred in the year. This review extends to the guidance within the employee handbook to ensure iterative improvements in road safety year after year. No event – A passenger in the vehicle could easily read a newspaper or email on a phone or tablet, LED remains solid colour (green). Amber or Yellow event (Medium Risk) – The passenger would naturally look up from the newspaper or email, Yellow LED will flash a number of times. Red event (High Risk) – The passenger feels the need to reach for a hand hold, Red LED will flash a number of times. After the trip has been completed, the driver can log in to an online portal and review their own performance data and overall scores. The system matches driving improvement tips to their performance with the aim to improve their overall safety score. 2. The manager’s perspective: Our managers receive alerts immediately when an amber or red event is triggered and can then take appropriate measures, which may be an informal 1:1 discussion or for repeated events used as part of our overall performance monitoring procedures. We have trialled different ways to encourage gentle competition between drivers to reduce their safety score, including a GreenRoad-led ‘Fleet Elite’ award which rewards consistently low safety scores. 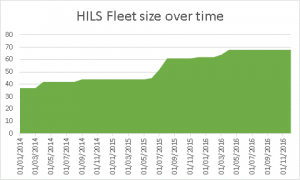 We also use high level management information, displaying the safety score of all of our drivers over time, to engage further with our drivers and develop a strategy to improve our fleet safety. We have seen a significant reduction on vehicle collision/damage incidents since the introduction of the GreenRoad telemetry system in 2013. The graph below shows that our annual incident numbers have reduced by nearly half from 14 to 8. Taken alongside the 50% rise in vehicle numbers over the last 18 months (see following graph) and the corresponding increase in mileage and therefore exposure to risk, this reduction is even more notable. As well as the collision reductions we have also seen a positive behavioural change from our drivers. Incidents of speeding have reduced considerably while at the same time individual driver’s overall ‘safety scores’ have reduced. The score is an easy-to-understand metric based on safety events detected while on the road. Managers can track safety scores by fleet, team, individual driver and vehicle. Our fleet insurance has reduced by 26.3% from 2015-16 to 2016-17. Improved customer service as a result of telemetry – if we have a client call up wanting to know how long it will be until we deliver to them, we can tell them exactly where the driver is and give them an accurate estimate of when they will be with them. Measurable higher standards of vehicle roadworthiness for the fleet as a result of better scheduled inspections. Reduced vehicle damage as a result of fewer collisions combined with our improved inspections result in higher end of life values at the end of the vehicles 3 year hire purchase. HILS is in a continuous state of self-improvement, and our lessons learnt are always learnt quickly and rectified as effectively as possible. Installing the telemetry system was a significant step for us but we have learnt that self-monitoring is a hugely important aspect to leveraging the best possible results. 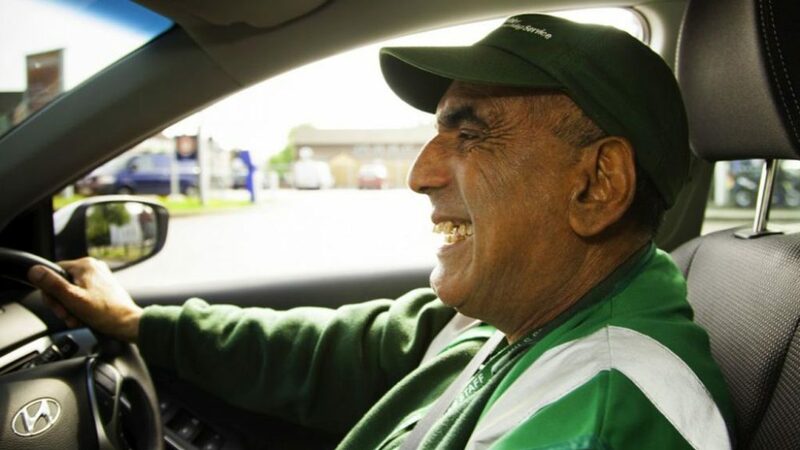 It helps to engage with drivers and has avoided our drivers feeling it has been installed as a means through which to enforce policy, rather than as a method to help them improve their behaviour. HILS are looking at adopting ‘driver safety’ DVLA and behaviour checks prior to employment, so that in addition to monitoring performance through the telemetry data we can avoid employing potentially unsafe drivers in the first place. We are looking at our home sites parking arrangements with a view to developing a reverse in policy; recognising not only the safety implications but also the cultural signs this gives out to our own staff and others who use the site.